The Plus One Beco Soleil is a functional, comfortable and stylish baby carrier with buckles, making it easy for you to put on and take off. 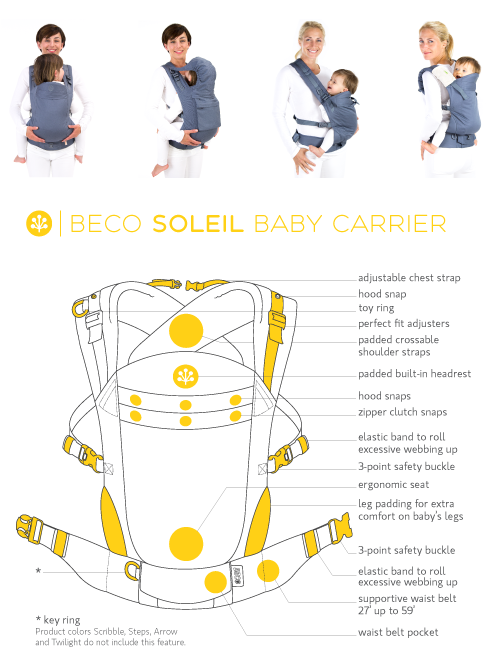 The Beco Soleil can be used on your front, back or hip. Start using it right away with the optional infant insert. Plus One is an all over print with varying sizes of plus signs on a dark grey background. The straps are grey. The Beco Soleil has a front waist band pocket and comes with a snap-on front carry pocket. SHIPPING ONLY AVAILABLE WITHIN THE US.